If you’re the maid of honour, one of your many duties is to organise a hen party that will see your bride off in the style and fanfare she deserves. But catering for the needs of a big group can be stressful; where to go, what to do and how to get there? A staycation is the best option for groups with varying budgets, giving you that giddy holiday feeling while keeping costs reasonable. For a hen to remember, heed the call of the Highlands and escape to gorgeous Edinburgh. The Scottish capital has it all; art, culture and gourmet dining while being moments away from the wild beauty of the countryside. Positioned between Waverley Station, Edinburgh’s main train station, and the Royal Mile, the Old Town Chambers is the perfect base for experiencing the best the city has to offer. Whether you go for Hogmanay and ring in the New Year with your best girls by your side or simply head north for a weekend of hen fun, this apartment has everything you could possibly need. Big hen parties deserve more than a hotel suite. That’s why the Old Town Chambers is the perfect location to set up your party pad. Some apartments have balconies overlooking Edinburgh’s famous rooftops; others have more medieval origins. For example, the Townhouse can trace its roots back to the 15th Century. Spread over three floors, you enter at ground level which has a huge master bedroom with a roll top bath in the corner. 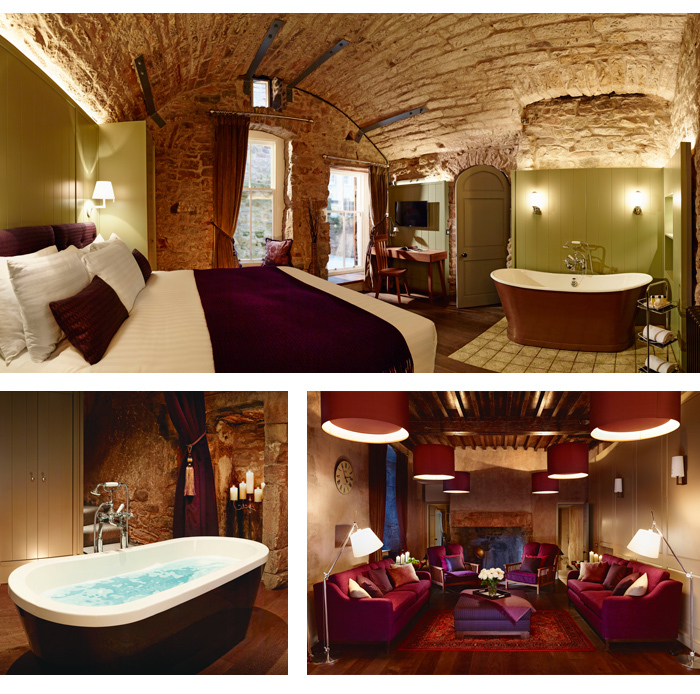 The vaulted ceiling can be admired as you soak in the tub or lie on the comfy Superking bed. All apartments boast handmade furniture and furnishings, double smoked French oak wooden flooring, Italian tiling and exposed stone walls, alongside top of the range kitchens, luxurious bathrooms, multi-zone heating, free Wi-Fi and Smart TVs. The Chambers are a collection of 5-star serviced apartments that give you all the luxuries of a top hotel with the freedom and space you’d enjoy in your own home. But to ensure everthing goes to plan, there’s a 24 hour concierge service on hand to find you the best restaurants, arrange taxis, help organise hen-tastic activities or simply recommend the best places to shop.